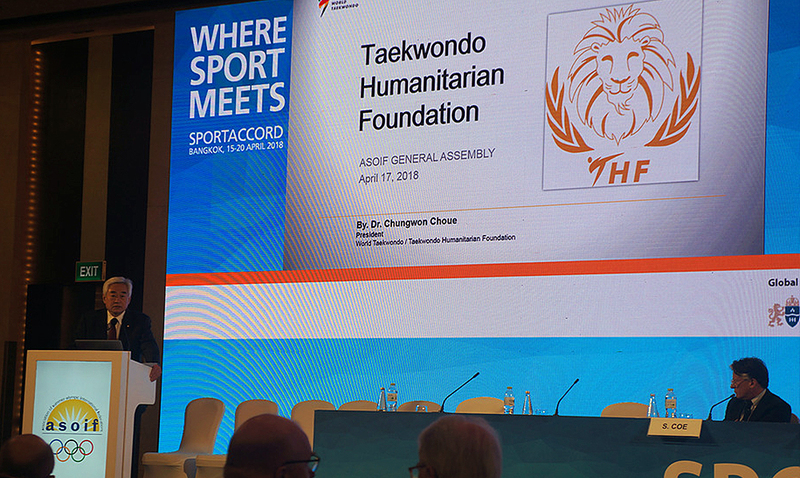 Thailand - 2018/04/20 - World Taekwondo President Chungwon Choue today called on International Federations (IFs) to join the Taekwondo Humanitarian Foundation (THF) in empowering refugees through sport. 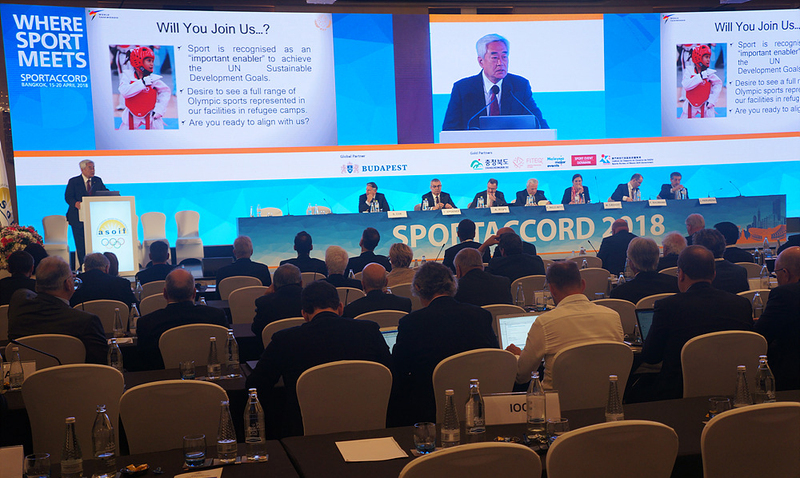 President Choue, who is also the THF Chairman, was invited by ASOIF to speak at the ASOIF General Assembly in Bangkok, to provide the attending IFs with an update on the Foundation’s activities. Officially established in April 2016, the THF now has active projects in refugee camps in Jordan, Nepal Turkey, Djibouti, Rwanda and France and even recently opened a purpose-built Taekwondo Academy in the Azraq refugee camp in Jordan. The THF deploys coaches and taekwondo equipment to refugee camps to teach young people taekwondo and use the sport as a vehicle for encouraging healthier living, understanding and peace. President Choue explained to the ASOIF General Assembly that the THF is looking to work with all stakeholders to ensure its projects are as meaningful as possible and would welcome the opportunity to partner with other IFs. “We face a grave global crisis. There are over 22.5 million refugees worldwide, half of them are women and children. The solution to this crisis can only be found through collaboration which is why we invite all IFs to collaborate with the THF and help us to empower the powerless. The power of taekwondo to promote peace and understanding was demonstrated at the PyeongChang 2018 Olympic Winter Games in February this year when World Taekwondo and the North Korean-led International Taekwondo Federation (ITF) performed a joint demonstration during the Opening Ceremony.